One of our favorite seasonal foods here in the Bay Area is stonefruit. Colleen loves it so much, she got peaches tattooed on her back. True story. I was at the Alemany Famer’s Market today to stalk the sour cherry vendor (2 more weeks…) and snagged a tasty-looking sample from a neighboring stall. All they had were yellow nectarines, which happen to be my favorite. Holy moly! They were amazing. So sweet, juicy, tart and creamy – the perfect stonefruit. I picked up a big bag of them for $3/lb (organic, too) with no real intentions for them other than shoveling them into my face. I left the Alemany market, took a detour for the Ferry Plaza Farmer’s Market and found that Cowgirl Creamery is now selling mini 4oz. tubs of burrata. While I have no issue plowing through a full 16oz of this sweet, creamy, heavenly cheese, I decided it would be better for my heath and pocketbook if I bought the little tub. It’s the perfect amount for two people and it only cost me $5. I remembered a cheesemonger once told me that the perfect accompaniment for burrata was stonefruit. 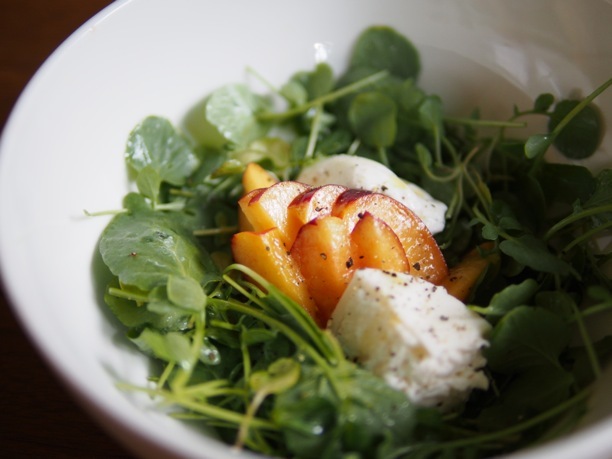 I then recalled a salad I recently had at Eno Wine Bar in Union square with grilled peaches, peppery greens and burrata cheese. It was heavenly, although the peaches were under-ripe. I thought I would do the concept justice and make my own rendition at home with perfectly ripe fruit. I picked up a big bag of watercress from County Line Harvest and took my bounty home to Brisbane. My husband and I enjoyed this lovely salad accompanied with a peppery champagne vinaigrette and a bottle of Wind Gap 2012 Trousseau Gris. Trousseay Gris was once widely planted across California, but these days there’s only about 10 acres of it left. 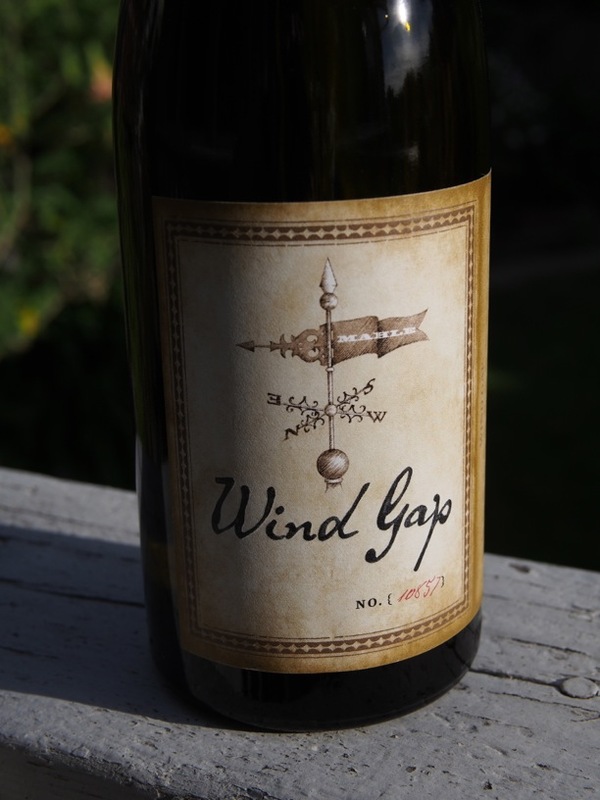 It creates a wine that is delicate and fresh with aromas of honeysuckle, mineral & citrus. It’s so fresh and delicious, I thought it would be a lovely compliment to our summery salad. The pair was a match made in heaven. You can pick up this wine for yourself for the super low price of $24. It’s hard to find a wine this delicious and well-made at this price point, so I suggest buying up as much of it as you can if you see it in a store. The salad was very easy to make, the recipe is below. Put the greens into a large bowl. Pour equal parts champagne vinegar & olive oil (about 1 oz each) into a 4 oz canning jar with a lid or a small bowl. Add salt and pepper to the dressing. Put a lid on the jar and shake the dressing, or whisk in the bowl. Cut your nectarine or peach into pretty slices. Cut your 4 oz. of Burrata into wedges. Pour the dressing onto the greens and toss. Plate equal parts of greens into two separate bowls. Fan out your stonefruit slices and place them in the center of the salad. Garnish the stonefruit slices with two wedges of burrata. Enjoy your amazing salad and wash it down with copious amounts of California Trousseau Gris.